Other Ingredients Honey, sugar, pear juice concentrate, gelatin, water; Less than 2% of: citric acid, colors (blueberry and carrot concentrates), fumaric acid, lactic acid, natural flavor, pectin, and sodium citrate. 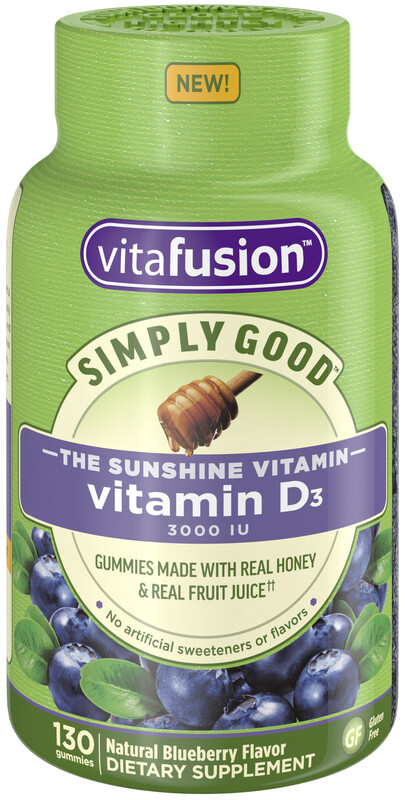 Serving Directions As a dietary supplement, Adults take two (2) gummy vitamin per day. Brand Intellectual Property (IP) Statement Information Real Fruit Juice Real Honey. Real Honest Nutrition. Simply Good™ is all about wholesome nutrition. It's a masterful fusion of fruit juice from deliciously crisp pears. Golden clover honey, and essential nutrients. No high fructose corn syrup, and made with colors from plants, fruits and vegetable. Precautions Take only as directed. Chew thoroughly before swallowing, Do not exceed suggested dosage. If you a medical condition, are on medication, or are pregnant or nursing, please seek the advice of a qualified health care professional before using. Do not use if inner seal is broken or missing. This product may settle during shipping. Do not expose to excessive heat or moisture. Color will darken over time. This does not alter the potency of the product.